A week or so ago, I received a trio of core beers from St. Petersburg's (Florida) 3 Daughters Brewing. It was pretty coincidental, but I had just started reading a book about the history and current beer culture in the Tampa area. The few pages and pictures dedicated to this brewery helped me picture it in my head. I hope to do a brewery tour in that part of Florida before the end of the year! According to the book, St. Pete Beach Blonde Ale is the mainstay, best seller, etc from 3 Daughters. So that's where I decided to start. 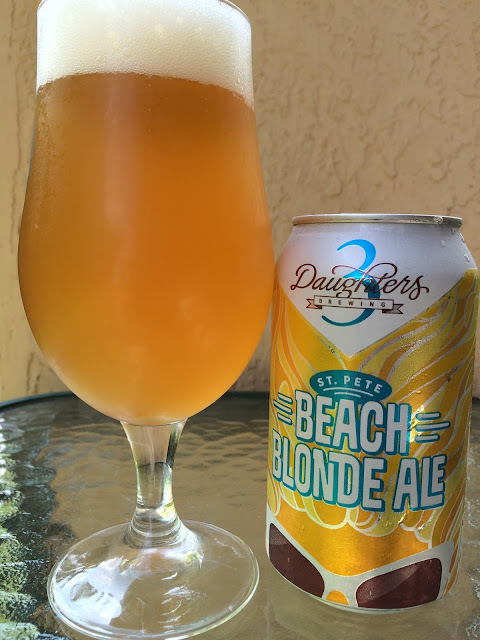 The can is mostly yellow and orange, and when you take a closer look, all of that color is the Beach Blonde's flowing hair. The only giveaway to that is the pair of sunglasses at the bottom of the design. Pretty fun. The story on the back titled "IT'S EASY ON THE TONGUE" lets you know to expect a refreshing and bright beer, a bombshell of a brew. 5.0% alcohol. 24 IBU. The number 26 is stamped into the bottom of the can which I guess could identify the batch but not sure. Light citrus and honey aroma. Malty sweet flavors to start, again with that honey aspect. There is a nice tangy orange flavor as well right from the start. A touch of citrus, a hoppy bitter balance and nice carbonation make for a flavorful and refreshing brew. Nice beer for the brewery to hang its hat on! Check it out (it's available locally in S. Florida now too).